The carryover 2019 Yukon continues arriving at dealers, and supplies are now where they should be. The mid-level Yukon SLT makes up the bulk of current stock. The base SLE and plush Denali are available of course, but you might have to do some legwork to track down either. Prices have eased off their highs, but don't expect to see substantial discounting. GMC has added a trim level below the SLT, called SLT Standard Edition. It's designed to bring the Yukon's pricing structure more in line with the Chevrolet Tahoe. Current factory offers will remain in effect until April 30, 2019 and are available nationally unless otherwise noted. It's possible GMC will enhance incentives for Memorial Day weekend. GMC is offering 7% off the MSRP of 2019 Yukon models in stock. If you finance through GM Financial, the discount increases to 9%. In addition, current customers of competing brands get an extra 2% off. That brings your potential discount to 11% — or up to $8,118 off a Yukon XL Denali. Your other option, which isn't nearly as tempting, is a flat $2,500 rebate on any model. Current lessees of non-GM vehicles can now lease a 2019 Yukon SLE starting at $449 for 39 months (10,000 miles a year) with $1,829 due at signing. The effective monthly cost is $547, an exceptional value for this price class. For everyone else, the cash at signing will be $2,000 higher, which is still an excellent deal. Remember, you'll get an extra 2% off MSRP when you finance your Yukon through GM. This ranks as an excellent deal based on our expert analysis of: vehicle price, length of lease term, amount due at signing, monthly payment, etc. The 2019 GMC Yukon maintains the traditional sense of what an SUV originally was: a body-on-frame design and heavy-duty drivetrain – but that doesn’t mean that it can’t have a dressed up styling theme and a full layer of comfort and high-tech features. The GMC brand has positioned itself as an upmarket Chevrolet, and the Yukon firmly sustains this hierarchy. 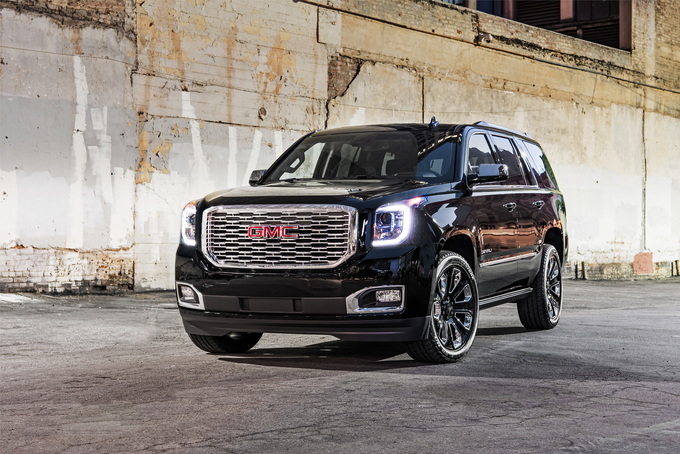 The 2019 GMC Yukon offers two new option packages on the SLT trim: the Graphite Edition package, which brings a darkened exterior appearance, and the Graphite Performance Edition package, which includes a host of mechanical and feature upgrades. The GMC Yukon comes standard with a modern 5.3-liter V8 that features direct injection and cylinder deactivation and is solely mated to a six-speed automatic transmission. All 355 horsepower and 383 pound-feet of torque are called upon to move this heavy vehicle, especially when utilizing the upper range of its 8,000-plus-pound towing limit. A larger 6.2-liter with 420 peak hp and 460 lb-ft of torque is paired with a 10-speed automatic transmission and is available with the new SLT Graphite Performance Edition and the top of the line Denali trim. The Yukon is also available in an extended version known as the Yukon XL, with prices rising between $1,400 to $2,400 over the regular Yukon depending on trim level. Stretching over 20 inches longer than the standard-length model, the Yukon XL offers a little bit more leg room for the second-row passengers and a lot more leg room for the third-row passengers. The cargo area behind the third row also increases in volume by 25 cubic feet. Fuel efficiency estimates are dependent on the drivetrain and model. The smaller engine with rear-wheel drive achieves an EPA-estimated 15 miles per gallon city, 22 mpg highway and 18 combined. Adding four-wheel drive brings significant hardware yet only reduces fuel economy to 15/21/17 mpg (city/highway/combined). Here, the added mass of the XL model becomes noticeable, as the EPA’s city and combined ratings are each lowered by one mpg. The more powerful powertrain achieves 14/23/17 mpg, 14/22/17 mpg with four-wheel drive, or 14/20/16 mpg on the XL. The four-wheel-drive system is optional throughout the lineup for $3,000 and includes an automatically engaging single-speed transfer case. Either transmission includes programming for a Tow/ Haul Mode and buttons for manual gear selection. The base SLE trim begins at $50,795 (all prices include the $1,295 destination charge) and features 18-inch bright aluminum wheels, front and rear park assist, and an eight-inch infotainment touchscreen that's compatible with Android Auto, Apple CarPlay, SiriusXM, and HD radio. Sound is pumped through a nine-speaker Bose audio system. The driver gets a 10-way power seat, a 4.2-inch driver information display, and a leather-wrapped steering wheel. Heated mirrors, automatic wipers, and remote start are also noteworthy standard features. The Convenience Package is $730 and brings a power tailgate, adjustable pedals, an auto-dimming rearview mirror, and a programmable universal home remote, while the SLE Value Package is $2,430 and includes the features of the Convenience Package and adds 20-inch wheels. The Enhanced Driver Alert Package costs $545 and brings low speed automatic emergency braking, forward collision warning, lane keeping assist, and automatic headlights. If towing is the primary reason for purchasing the Yukon, the $580 Heavy Duty Trailering Package features an integrated trailer brake controller, a revised rear axle ratio, and an air leveling rear suspension. On four-wheel drive models, a two-speed transfer case is included. The SLT Standard Edition is priced from $55,995 and includes the features of the SLE’s Convenience and Enhanced Driver Alert Packages. Standard features include leather seating, heated front seats, a leather-wrapped steering wheel, a power programmable liftgate, and memory settings for the seat, pedals, and mirrors. The Heavy Duty Trailering Package returns unchanged, while an available Open Road Package costs $3,430 and includes a sunroof, navigation, a rear seat drop-down screen with Blu-Ray capability. The Standard Edition Value Package brings the sunroof, second row bucket seats, and 20-inch aluminum wheels for $3,540. The SLT trim starts at $58,795 and gains perforated leather front seats with ventilation, a heated steering wheel, heated second row seats, and proximity entry. On the safety front, a blind-spot monitoring system and rear cross-traffic alert are also included, while adaptive cruise control is a standalone option for $895. The $3,920 Premium Edition Package adds 22-inch chrome wheels, chrome body side molding, a unique chrome grille insert, and a polished exhaust tip. The Graphite Edition package ($3,070) includes bright 22-inch wheels, gloss black trim, black chrome grille, and body color grille surround, while the Graphite Performance Edition package ($5,995) adds the larger engine and 10-speed transmission as well as magnetically controlled dampers, black 22-inch wheels, the features of the HD Trailering Package, an eight-inch display in the gauge cluster, and a head-up display. The Open Road and Heavy Duty Trailering are also available. The range-topping Denali trim starts at $67,895 and sets itself apart with the 6.2-liter engine, a unique front chrome grille, HID headlights, 20-inch wheels, wood trim, an eight-inch driver information display, magnetic ride control, and a head-up display. Meanwhile, the front seats are heated, ventilated, and leather-appointed. The optional Denali Ultimate Package ($8,055) brings power side steps, adaptive cruise control, forward automatic emergency braking, a power sunroof, and the contents of the Open Road Package. The $1,000 Denali Ultimate Black Eddition sees 22-inch black wheels, chrome exterior mirror caps, and premium carpet inside. The 2019 GMC Yukon is attractive with its ruggedness and wide range of capabilities. The vehicle feels most purposeful with the added features of the SLT Trim and the optional adaptive cruise control for those long hauls. In an era of crossover utility vehicles, traditional SUVs almost seem like an outlier. 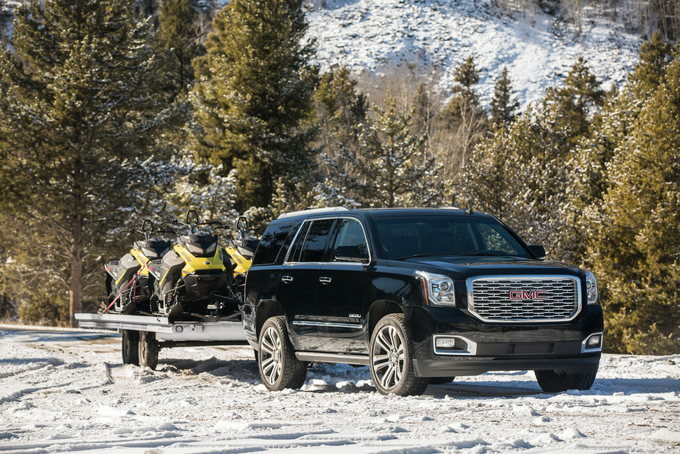 Yet, models such as the 2019 GMC Yukon and the extended wheelbase Yukon XL provide the room and utility that customers prize. A pair of big V8 engines move the Yukon, supplying top power and utility. The 2019 GMC Yukon and Yukon XL are full-size SUVs. The difference between the two has everything to do with the wheelbase, which adds 14 inches on the XL. That extension benefits third-row leg room and cargo space. GMC offers four trim: SLE, SLT Standard, SLT, and Denali. Most models have a 5.3-liter V8 engine with a six-speed automatic transmission. 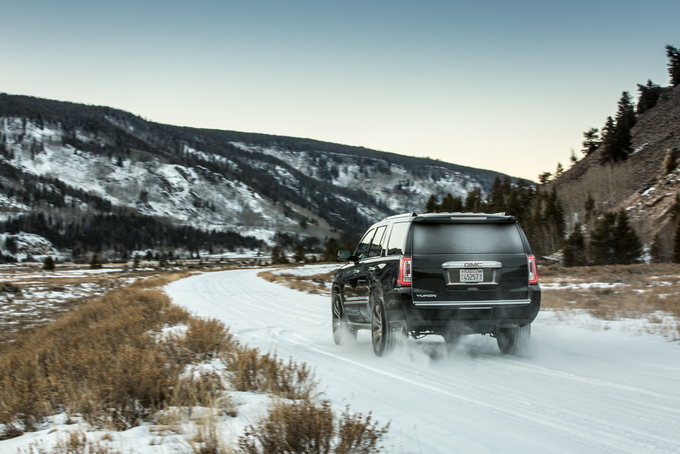 The Denali models come with a 6.2-liter V8 engine and a new 10-speed automatic transmission. Standard features include fog lights, 18-inch wheels, power-controlled and heated side mirrors, a luggage rack, a tilt steering wheel, cloth seats, three-zone climate control, a nine-speaker audio system, OnStar, and a Wi-Fi hotspot. All Yukon models except for the Denali and a special SLT package come with a 5.3-liter V8 engine with 355 horsepower and 383 pound-feet of torque. We found the engine satisfactory, although the 6.2-liter V8 with 420 hp and 460 lb-ft of torque is better suited for this SUV. Moreover, GM pairs this engine with a new 10-speed automatic transmission, which unfortunately isn’t teamed with the standard V8 engine. Regardless, both transmissions shift smoothly and work well under heavy loads. The standard engine delivers ample step-off acceleration and generous passing power. This SUV stays planted for the most part, with body roll on twisty roads kept to a minimum. Its steering is light to the touch, although the Yukon’s girth is always evident. Traditional SUVs have a body-on-frame design. Similarly, they’re boxy with a big grille, massive hood, strong shoulders, and a long body. The GMC Yukon ticks off these requirements and offers its own take on style, including its swept-back headlights. Inside, the cabin is big, but the third-row area is tight, especially in the Yukon. If you’re looking to house seven or eight adults in comfort, the Yukon XL is the right choice here. 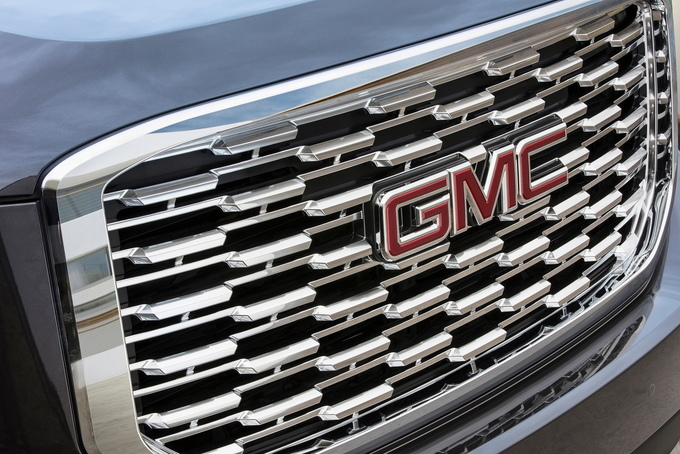 In any case, we like this GMC’s curvy, symmetrical dash, which is punctuated by an eight-inch color display. 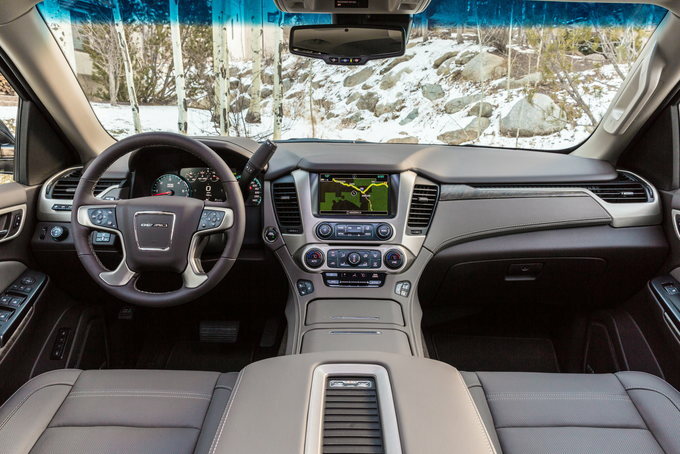 If you want luxurious embellishments such as chrome and imitation wood trim, the Denali does it. Otherwise, we think most people will be satisfied with either one of the middle two trims, as these offer a satisfying blend of amenities and value. GMC offers powerful engines, which ensures that these big SUVs have no lack of power even under strenuous conditions. That said, the engines consume a lot of fuel, despite cylinder deactivation that shuts down half the cylinders under certain conditions. Large families and outdoors enthusiasts are naturally attracted to the GMC Yukon and the Yukon XL. Seating for up to eight makes this ideal for some families, while a towing capacity of up to 8,500 pounds appeals to the outdoors set. On the other hand, the GMC duo may be too big and expensive for some customers. Fortunately, a GMC Acadia or a Buick Enclave should satisfy the vast majority of utility vehicle shoppers who still want generous passenger room and storage space. The 2019 GMC Yukon and Yukon XL deliver what certain customers want and do so faithfully. Prices, however, can climb quickly, putting this SUV outside the reach of some consumers. That said, the Denali trim certainly is gorgeous, delivering premium features few mainstream models can match.